F15 Smart Watch works as a good sports partner. Featured with 1.3 IPS color screen, it enables you to view data clearly both in day and night. 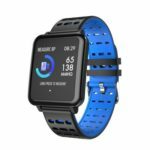 It includes almost all functions you could expect from a sports bracelet like heart rate/blood pressure/blood oxygen monitor, sleep monitor, message/call reminder, remote camera, and more. Your life would be simpler and more healthier with F15 fitness bracelet. 1.3 inches high resolution color screen allows you to see the screen clearly whether you are under bright sunshine or in a dark environment. 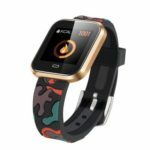 Built-in high sensitive sensor chip, real time monitoring heart rate, blood pressure and blood oxygen. 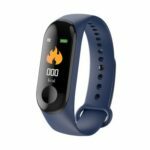 Press the key to enter the movement mode monitoring, 7 kinds of sports mode available including walk, run, ride, skip, badminton, basketball, and swim. 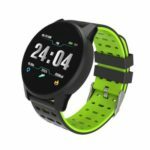 The smart watch automatically monitors the movement of mileage, calories consumption, and check the number of steps walking in the day, and synchronize to the APP, enabling you to view and analyze the movement data in APP. Monitor and record your night time sleep including light sleep, deep sleep, wake up and other data, so that you can adjust the sleep habit to improve health index. 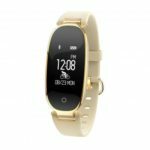 The smart bracelet will vibrate to remind you and display message on the screen, you&apos;ll no longer worry about miss any call. Solve the limitation of self-timer, quickly take a photo by rotating the arm when wearing the bracelet. You can remote control phone music playing when the watch is connected with APP. No need to take out your phone to change music while running. 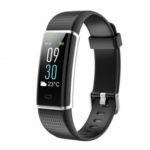 Screen brightness adjustment, weather forecast, incoming call remind, stopwatch, alarm clock, sedentary reminder, find bracelet, etc.